Tim Madden with the 60-years overdue book. In late December, 2018, Tim Madden stumbled across an overdue Library book in his Ontario home. We mean really overdue. He reached out to Janice Fiander, Manager of (the now named) Alderney Gate Public Library. 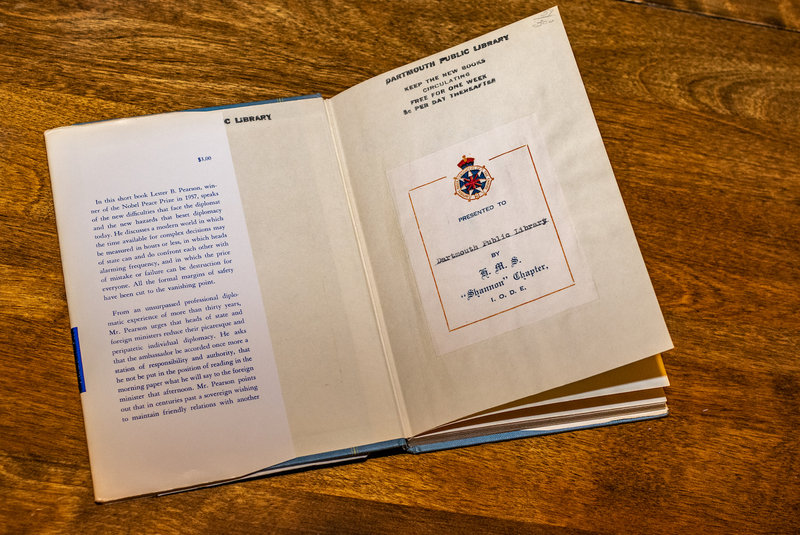 I discovered a book in our family library that belongs to “Dartmouth Public Library.” Book ID# 327 P362 , Diplomacy In The Nuclear Age – Lester B. Pearson, 1959. Checked out on Dec 21, 1959 and not returned. I suspect the book was checked out by my uncle, Jerry Madden, however, it could just as easily have been checked out by my aunt, my father, or my mother. Tim shared that his father, Rodney Madden, was born in Dartmouth and had lived there until departing to Brockville, Ontario with Tim's mother, Phyllis in 1964. Tim believes that his father's brother, his uncle Jerry, most likely checked out the book. [Jerry] studied Theology at Mount Allison University (Sackville, NB) from about 1952 until 1956. He graduated in 1956/57 with a BA. He went on to become an ordained minister for the United Church, I'm told. He volunteered with the Brockville Children's Aid, and he worshipped at (if not worked at) Wall Street United Church and/or St John's United Church in Brockville. He died in 1966 (age 30) when I was only 5 months old. He was laid to rest with family at Mt Hermon Cemetery in Dartmouth. Uncle Jerry was an avid reader, to say the least. His interests in books were religion, politics, world affairs, language, poetry, and of course any good mystery story he could get his hands on. When he passed, my father inherited his rather large book collection, among other things. Dad preserved and protected the books for almost 50 years, until he died in 2012. I inherited the collection of books when dad died, and... you know the rest. Jerry Madden, pictured in the 1956 Mount Allison University yearbook. It wasn’t until today that I noticed the name of the author—the man who would become Canada’s 14th Prime Minister, Lester B Pearson!! This book was published four years before he was elected PM. Neat, eh? The book is still in very good shape considering its age (almost 60 years). This was the first Canadian edition of this title—printed in USA and bound in Canada. 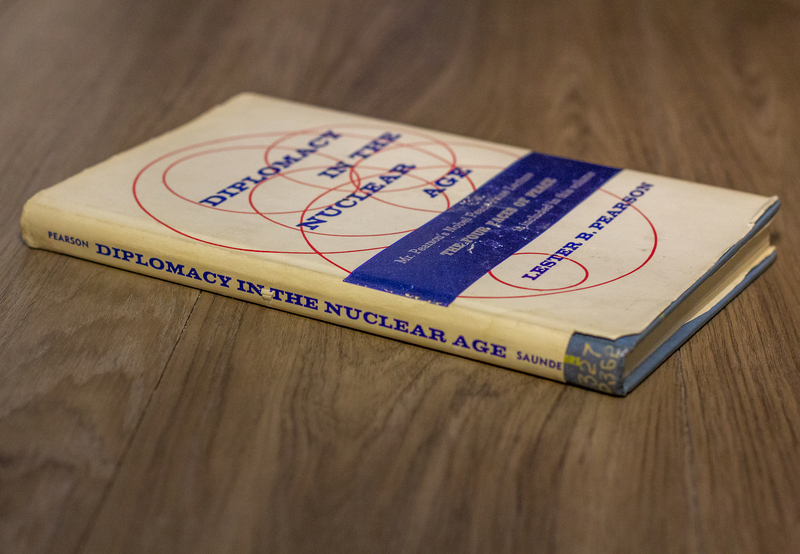 Diplomacy in the Nuclear Age - book spine cover cut to reveal call number. 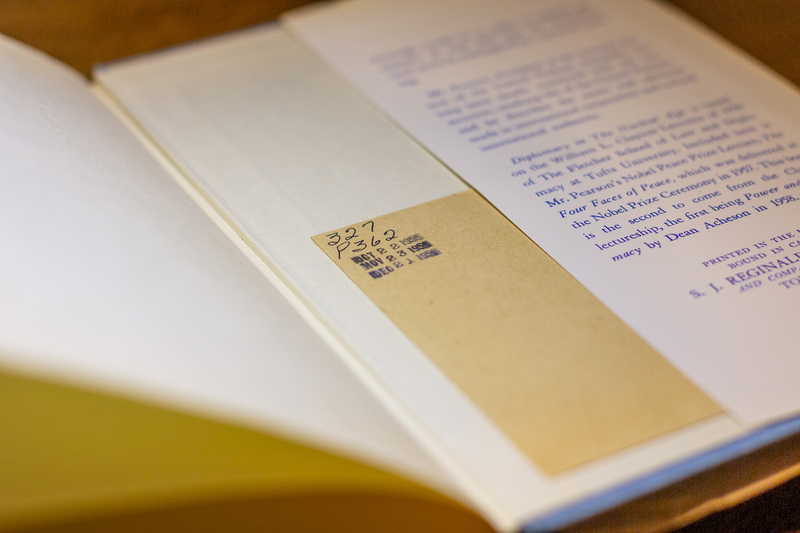 Library staff hand-cut out the cover on the book's spine to write its call number (see photo above). The book cost $3.00 for the Library to purchase in 1959. The rate of 3 cents per day in overdue fees would equate to 43 cents per day in 2019. Jerry would have been the third (and final!) person to check this brand new book out from the Dartmouth Public Library. 3 cent/day fines noted inside front cover. First off, all overdue fees were waived for the book. "We'll keep it in a safe spot in the Alderney Gate Public Library for anyone who wants to see it!" says Janice. "It's too good a story not to tell. 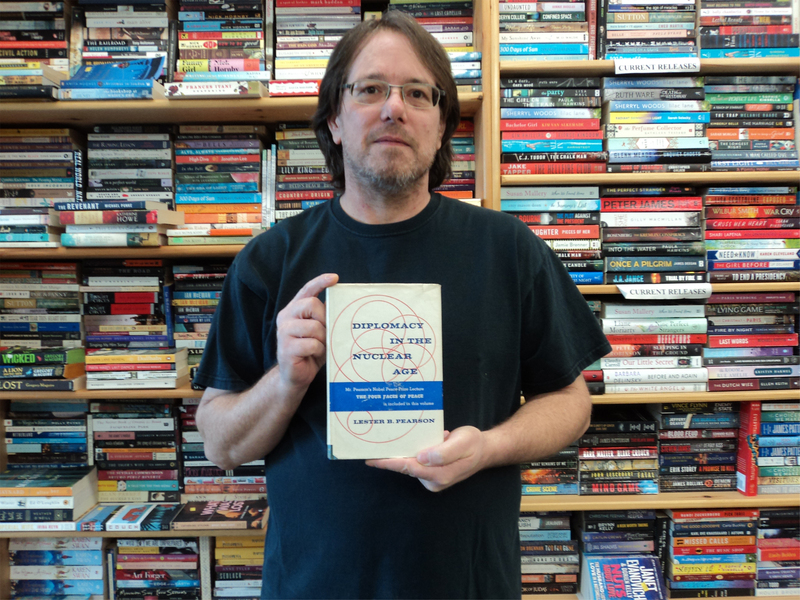 We so appreciate that Tim reached out and that this book is back with us for good." It's these kind of special stories, outside of books, shared with us by you, that make Library Life all-the-more wonderful. "How can there be peace without people understanding each other, and how can this be, if they don't know each other? How can there be cooperative coexistence, which is the only kind that means anything, if men are cut off from each other, if they are not allowed to learn more about each other? So let's throw aside the curtains against contacts and communication."